A great option for those in search of a loud, responsive snare that won't get garish. Sensitive with plenty of volume and projection on tap. Good build quality. Previously, Taiwanese firm Dixon has been known for its affordable and reliable drums and various accessories and other components. That changed with the introduction of the Equator and Artisan Series - two ranges of pro quality snares. Here we're looking at an Equator hybrid maple and carbon fibre snare. "This snare seems quite sensitive to the slightest touch, perhaps with the transference of stick energy through the carbon fibre"
The Equator is packaged in an Artisan box but shares the same standard of build as its higher-end brethren. Equator appears to be in a separate sub-series alongside other hybrid cousins, including oak/steel and steel/aluminium drums. 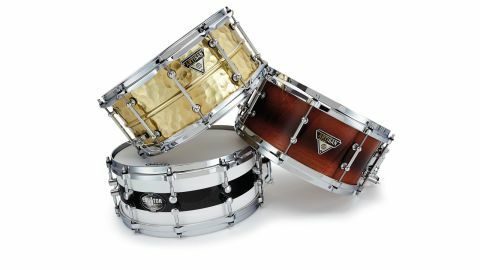 Before a snare is marketed, Dixon's drum designers swap and change shell material and drum furniture with a mix-and-match approach. Only after tests in the sound lab and feedback received from many of their players are the drums ready for the drum store. The supplied heads are a white coated Evans Level 360 for the batter, partnered by a thin, transparent Snare Side 300 - also members of Evans' excellent Level 360 family. The shell of this review model is maple with a thin inner of carbon fibre bonded onto the shell wall. Externally, the finish (which awards the drum its moniker), is a white wrap with a thin band of carbon fibre around the shell. With the Equator we would expect maple to be warm but we think the carbon fibre could add a little extra bite. A couple of hits demonstrate the snare's underlying metallic overtone, with the effect of brightening up the maple while retaining its fundamental tone. This snare seems quite sensitive to the slightest touch, perhaps with the transference of stick energy through the carbon fibre. Volume and projection is available by the bucket-load but it doesn't mean it's the least bit garish.